Hello Cynthia, New Noseband arrived safely. It is FANTASTIC! Here is Ali in his "old" bridle with "new" noseband. Works brillantly. Very easy to change the bridle. 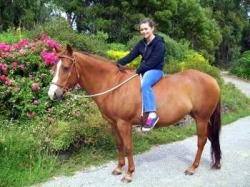 Happy Riding, from Nan C. (& her horses too)" Tasmania. "The bitless noseband arrived yesterday and I changed my old Parelli bridle into a bitless bridle today and put it on my horse. It looks great. 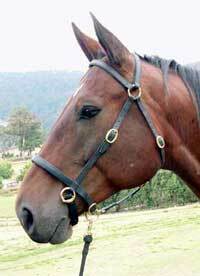 It was easy to insert the noseband into the bridle cheek straps. I did manage to go riding for a half hour with the new bridle and River and I both loved it. He was as responsive as usual and it left no marks on his nose - the previous side pull bridle did leave marks and I always felt guilty about that. I also love it because it's so easy to lead him with it and the snap-on reins I already had work great." Mariette in Canada. "THANK YOU so much for the bitless bridle nose band. I have used other bitless bridles before but NONE as good as this. today with trucks, motor bikes, farming animals, snakes the lot. My pony has gone better than ever before in our entire 5 year relationship. speed until today with his new bitless noseband. for me to ride, not share, because I knew him so well. This pony is truly a changed little man and he says THANK YOU CYNTHIA." "I recieved my lightrider noseband last week. I was impressed with the quality and softness of the leather. 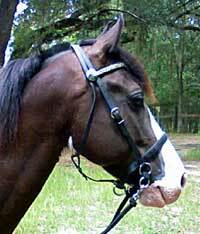 I had been using a mechanical hackmore and a cross under type bitless bridle in the past. I was astonished at how much lighter rein aids I had to use and the softer, quicker response from my horse. He is a very young 22 year old arab who was very spooky and flighty that day (having not been worked much over the long winter). I had total control despite many large spooks and jumps. I can't wait for spring so I can use it more and try it on other horses! I am incredibly impressed and will be telling all my friends! I am on a natural horsemanship crusade -training to become a barefoot trimmer and riding all our horses bitless to show the way to others; and will highly recommend your bridle to everyone! I can see exactly why you call it "lightrider". Endurance in the USA: Here is a shot of my horse "Ferrari" doing his first 25-mile distance ride and using our new LightRider Noseband with the custom headstall and breastplate from Taylored Tack. He loved it! At times, he was pulling rather strong because of excitement, but was always controllable. Terry B. Read more reviews on the LightRider Bitless Noseband here. I received my bridle a couple of days ago. Let me say before I go any further that I am extremely impressed with the quality of this bridle! Very well made. Substantial and it is very attractive. I got the western style. I got my first chance to try it this morning. I had a couple problems with my TWH using the crossunder bitless bridle. First Feather, would get very bracy at times would just kind of get a bit catatonic for a few moments. He would go fine at times and be very responsive but, when he decided he didn't want to do something he would just brace through it all. I have been trying to get a nice light neck rein on him for quite awhile. So I have been looking for a different alternative. I came across your bridle and thought maybe this was just the answer for Feather, and I. It works on a totally different concept. Well it is just what we have needed!! We went for a short ride this morning and Feather never braced with me. He just neck reined beautifully. Never pulled on me or tried to push through the pressure, I guess actually because his head wasn't wrapped in pressure! He also had a very nice whoa. We want to thank you for designing this great product! I was never going to ride in a bit again period so am very happy to find this alternative. We dearly love this bridle. Thanks again for creating this wonderful bridle for all of us." Sue M. in FL, USA. Read more reviews on the LightRider Western Bridle here. “I purchased the English bitless bridle from you at the Equus Inspiration. I am using it on my 7yo arab who has only recently been backed and handled. He has taken to it like a dream, he is so responsive, he was running through the bit and now he is so happy and I have full control with your fantastic bridlle. I was recently in a situation where I thought there was no way I was going to pull him up, but I was able to control him so easily and there was no fighting. I am now completely sold on the bridle.” Jodi, Tasmania. "Besides looking lovely on him and I was pleased with the quality of it - it proved to be as good as the rope one - in his responsiveness, so my reservations on the type of bridle seemed unfounded. He is very happy and soft in it, and again when he wanted to go back to the other horses he didn`t fight me like he would do on a bit. He turns lightly and it is lovely to ride him in it." Mandi in NSW. "It's just great! I've been using a crossover one prior to this, which I was reasonably happy with (except the pressure sometimes didn't release straight away), but the difference is really noticeable. My horse is much happier in it, and responded the unbelievably light aids - I felt a bit like I was riding her with feathers! What a great design - I'll be doing my best to get other people over here using them." Jess R. New Zealand. "Thought I would give you an update of us jumping in the new bridle. Its been great so far, it took a couple of days to get used to, and I had to tighten the chin strap a couple of times to get it right, but we are sorted now and going well! Abbey is a bit crazy in big open spaces at the moment, cantering sideways and threatening to buck and just getting generally excited and skitty - very scary when your horse is 16hh and just as wide! But I still felt safe with the bridle and was in control as much as I had been in the halter previously. We went to jump club without any problems and had no comments that there was no bit in her mouth - it was very inconspicuous! She is responding well to it and I am very happy so far - looking forward to competing later this year too!" Daisy, NT. Read more reviews on the LightRider English bridle here. "I am sending you a picture of my daughter Amaya riding Candy Girl in your stock bridle. We bought it last year and we have been very happy with it, Candy accepted it no problems. Until we bought it we were riding bitless in a rope halter and our requests to Candy were not always clear enough and although she is very generous and kind with us, Amaya sometimes felt nervous when riding out because Candy would take over. Now there is no doubt as to the direction in which we ask her to go and there is no resistance. Amaya is thrilled and we have had many interested comments from friends in riding club and pony club, (we dont go to either but we have friends who do). The bridle looks lovely on her as well which is a bonus, much better than the rope halter." Absolutely Delighted"Our Stockhorse style LightRider bitless bridle arrived today. I want to thank you for getting it to me so quickly and also for recommending I change my order so that the zigzag reins and clips match my choice of a black leather bridle with brass fittings. Yours is the most efficient and personal online sales service I have encountered and you have a great quality product to boot. Well done to you. I am absolutely delighted with my purchase and I have only had it for a few hours. Our new bridle looks great – like a classy traditional bridle, was easy to fit on Sienna – only have to undo the throat strap to get it on and off, and provides the control of a bridle without the pressure of a bit! All this and I’ve only tried it on Sienna for a short time. She took to it very well, was relaxed throughout and even felt comfortable enough to begin grazing which is something she very rarely does in a bitted bridle and never before without pawing at the ground. Thankyou again for making this “horse friendly” bridle available." With regards from both Sienna and I, Jacqueline. 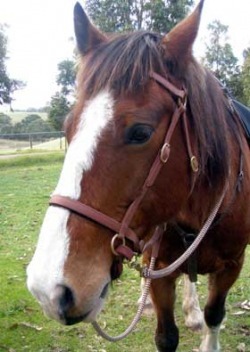 "Just to let you know that I have fitted the Stockhorse Bitless Bridle and it looks great!!! It looks and even smells like leather! I had a look at one of your bridles at a clinic back in January. Since then, I've been doing some research and liked yours the best. I put the bridle on Wunjo at liberty.....at first he wasn't too keen as he didn't like the jangling of the metal against metal and I think he was expecting a bit from the way I put it over his ears (we've only been using a halter for the last 2 years), but once on he relaxed and we did a very small bit of ground work with excellent results. We'll be taking however long it takes before I'm in the saddle with it, but once there, I'll have more feedback for you. I'm looking forward to experiencing a ride with the new bridle. Thanks so much for taking the time to figure something out to help our horses have a better life with humans and for making it available to anyone who wants to try it out!!! " Kath in Victoria. 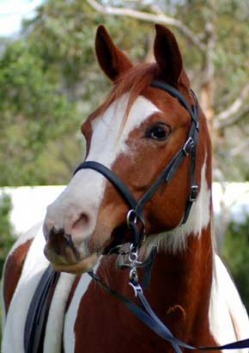 Read more reviews on the LightRider Stockhorse Bridle here. Here is a photo of my Brumby Adina with her bitless bridle on, we were at the Victorian Brumby Association annual Show in December 2010. It was my first ever show and I think it was Adina's as well. We got a second in the ridden class. Also a lot of people can up to us to find out were got the bridle from, they were very impressed with how Adina preformed while wearing it. Lisa Silk. Cinch Magazine - an online magazine based in Canada have been running independant tests on various bitless bridles including he LightRider (model tested: Standard Stockhorse) and here are the results which of course I'm very happy with! 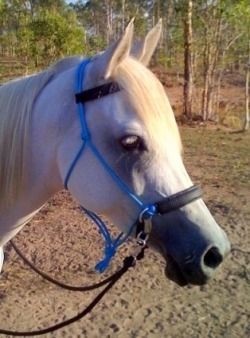 Comments: The LightRider is a unique bitless bridle design featuring a sliding chinstrap. Its composition focuses on being light on the horses head, but nonetheless offering clear, light signals. It is one of the best looking bridles of the batch, and is available in many designs so neither english nor western riders will feel left out. The LightRider cleans readily with soap and water and does not fade in the sun. It is the perfect all around bridle for use during trail rides, endurance or recreational pursuits. This bridle is not available in leather, which may be a downside for some, and may perhaps limit its popularity in a showing atmosphere (where bitless is allowed). A nice advantage to the LightRider is that it is abundant with versatility. It can not only be used for riding, but has a removable strap that converts the bridle into a lunging cavesson-type head gear and halter. This saves time and money long-term, and is convenient that you can easily tie the horse during a trail ride or for grooming and saddling. In Use: Throughout hacks, jumping and schooling, the LightRider never missed a beat. Horses responded well and rode confidently in through the bridle. Through work the horses responded lightly and effectively to cues. The only minor complaint being that from a standstill (using solely the bridle) a couple of the horses were able to resist the aid to turn- during faster work, this never proved an issue. Conclusion: The LightRider is a surprisingly effective bridle in an easy to clean, light weight package. It is one of the gentlest bitless bridle designs, but yields fantastic results. It may not be suitable for the show-ring because of its material (leather will be available soon to solve this), but it is well-adapted to schooling, hacking or endurance ventures. A general observer would not notice that there is no bit in the mouth, except upon closer inspection. Some riders will especially appreciate that the LightRider is very traditional in styling- it doesn’t compromise style or safety. "I just wanted share a photo of my beautiful Arabian mare Solange in her new Bitless halter/bridle. Doesn’t she look lovely and so relaxed? She is very sensitive and had started to develop some bad behaviours like opening her mouth, throwing her head and more recently threatening to buck when I asked her to stop. I had been advised to use a nose band on her to stop her evading the bit but wanted to find a gentler alternative to tying her mouth together. I first saw your bridle at Equitana and loved the simplicity of it but sadly it took me a year to finally buy one. The good news is that after a few short rides I can see a huge improvement! She is listening to my leg and seat aids more and the best part is her brakes are much better as she is not tensing when I ask her to slow and stop. We still have more work to do but we are finally making progress rather than getting worse and I feel much more in control. I have ridden in a rope halter before as I liked the freedom it gave her, but I found it didn’t give me the communication I needed and also had a tendency to mark her soft nose. Your bridle combines the communication that I need, the lightness of a halter and the comfort of padding as it has never left a mark on her - even after an hour long ride. So thank you Cynthia – you have definitely helped us!!!" Judy W. Queensland. "I purchased two bitless rope bridles approximately two years from you and have found them to be wonderful. I use one for my endurance horse and one on my young horse, both horses round beautifully when asked and with the slightest of aids. I have had quite a few comments from people in regards to how happy my horses seem, and I believe that apart from being devoted to them, a lot has to do with not putting a bit in their sensitive mouths. and LightRider Performer Bridles here. “I bought your Light Rider bridle at Equitana and the funny thing is, it was a spur of the moment decision and has proved to be so beneficial for Luke and me. For Luke, because I don’t hang on his mouth anymore due to tension, and for me because it has reminded me of how I used to ride in my teens, relaxed and with ask and release. My aids are lighter. 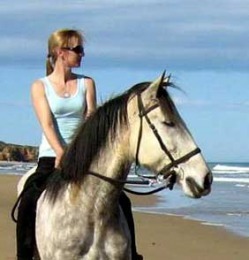 Both horse and rider are more relaxed and more confident, (thanks also to Jenny Pearce’s clinics and books). As far as the design of your bridle goes, it is effective without being harsh. It does not take them long to adapt to no bit. "I had tried a bunch of bitless bridles but wasn't happy with any of them and kept going back to my plain old halter hackamore. The biggest reason was the lack of release or very slow release. Cynthia's new Light Rider, I just love it! It has a snug fit for direct and clear communication, it doesn't close down on the horse when you are having a conversation about what you would like them to do, and yet it has the "pull through" if you were in a situation where you needed to rely on the rein to pull your horse around into a bend. Hopefully never, but it could give you confidence to have that ability. Woo hooo!! She's done it!!! Author of "Bobby's Diaries - Straight From the Horse's Mouth to You" and "A Zen Connection with Your Horse". “The bridle is fabulous thanks. I have ridden my horse 'Huckleberry' (photo right) in a crossunder style bridle as well as a riding halter bridle, and yours would appear so far to be the most comfortable one from the horse's perspective. My horse usually has impeccable manners when on his own, however when with a group of 'mates' he gets understandably excited, and sometimes I have to apply more pressure than I would normally like, in order to get him to listen. So far so good. Yours looks lovely and fits him well.” Thanks again, Kelly C. Vic. "I then got my pony out, put your new Light Rider Bitless Bridle on him, and guess what - he responded soooo much better to this bridle, than the one I have used for him until now. I got a cross-under bitless bridle for him, and always wondered why he tended to brace himself, when I gave him rein aids. He seems to hate the pressure around his whole head!? With your bitless bridle he was smiling and responded straight away to my aids. So, now we have the whole horsey family on your Light Rider Bitless Bridle!" 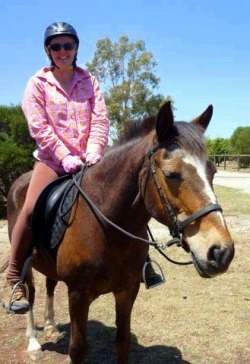 Kaya Femerling (Natural Hoofcare Practitioner) NSW. "I was very pleased to come accross your design and since receiving it my off-the- track thouroughbred has been a dream to ride. I was given this horse literally straight from the track...one day racing...next day mine. I have spent the last 2 months retraining him and the biggest and the most rewarding changes came about when we started using your bridle. No more jig jogging, no more frantic sweating prior to a ride, he's now relaxed, cool calm and collected. No more head shaking and a willingness to flex in any direction with hardly any pressure. People often ask me why I went for the bitless bridle and I am passionate about telling them my experiences and about all the reasons why we should treat our horses with respect and dignity and not as a slave to our leisure...at an often painfull cost. To this end I have converted many to bitless bridles...in one of the toughest horse riding towns.....including a friend of mine who is a rodeo pick up rider and rides his horses hard and fast. Initially he thought I was kidding when I guaranteed him one particular horse would respond better to no bit than with a bit. This horse has the most unbelievable sensitvity to pressure I have ever seen.....and within 10 minutes of riding bitless his owner was won over and has since ordered a number of bridles to start training his other horses of various disciplines including cutting and reining, roping, pickup and also barrel racing. So after all that I would like to say thank you for designing such a simple and versatile bridle that I will continue to use as long as I have horses... and expect a few more orders from me in the future and also from those I have influenced up here in the top end. Thanks, Bec." Darwin. NT. “I am impressed with the bridles. I have to admit that when I first heard of them I thought they were just another version of the “bigger bit” theory, however I now think that they are a very good alternative to a natural hackamore. I have had good feedback from the whole family, husband, 12 & 14yo boys as to how they like them. My personal opinion is that they are very good for novice riders and for using on green horses. This is because I have noticed that with natural hackamores novice riders can tend to twist the horses head when asking for lateral flexion. The light rider bridle seems to deliver a much clearer and more direct message when using it to convey lateral messages to your horse. 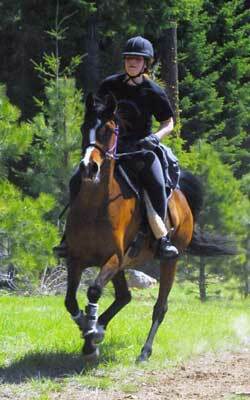 It is also ideally suited to endurance riders as it can still give you a lead rope if you need it. All round the horses and humans all appreciated their new bridles. Thanks," Tara N. Tasmania. "Cynthia, I just wanted to touch base with you about the Light Rider Bridle. I completed the 40km ride at Woodstock successfully. I was very pleased with the bridle as I had heaps of control, and she listened. Overall I was really pleased with it and will definitely be ordering another one soon so I have a spare." Danielle - Tasmania. "Bridle arrived safely thank you. Tammy, Mark and I went to the beach to try them out. We were all very happy with them, so much so that Mark and I would like to order another one. 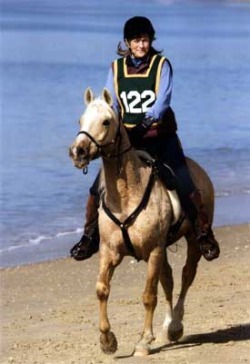 I felt that I had good control with Roy at the beach as naturally being very fit at this stage he was in a hurry on the ride back and I was able to keep him at a reasonable speed easily." “I loved the bridle! Ziya (photo right) was very "Right Brained" for the first half of the ride, but she stayed in hand really nice. I know Elizabeth did great with hers too. Our horse were the only non-booted barefoot horses at the endurance ride. "I was having real trouble with my 20yr old mare, Chloe accepting any bit whatsoever. She absolutely hated being ridden with a bit, tossing her head, not listening to the rein aids etc. We tried just a halter but there was no one rein stop and she just pulled through your hands and left me with not much control at all. After chiro and dentist visits, Merry suggested we try your bitless bridle and after one session in the round yard to get used to it the difference is amazing! No tossing the head, she listens to the lightest of aids, she is easier to handle, has emergency brakes and most of all she is happy. She enjoys being out on the trail. She even cantered for the first time for me the other day and loved it. Thankyou for designing this product. I can't believe the control and how much better I feel riding her now that she is happy. Personally I have ridden horses that accept the bit happily but still didn't feel as in control as I do riding with the bitless bridle. Thankyou again," Jenny Keenan. Tasmania. “The Light Rider bridle arrived yesterday, thank you so much for your very prompt service!! I rode with the bridle yesterday and today and I am very impressed, it's very well made and nice and soft, much softer than I expected. My horse seems to really like the bridle too, she is used to being ridden in a rope halter so I expected that it would take a while for her to get used to the Light Rider bridle but she was happy in it straight away and was even more responsive than she is in the rope halter, I must admit I was expecting that she would be slightly less responsive so it was a pleasant surprise to find the opposite. To give you a little history on my horse, she is 14 years old and has been ridden in a bit until recently, she is also a chestnut TB mare who has raced and is prone to 'leaving the scene' when something (everything) scares her. I found that schooling her with a bit was adequate but I had to be strong and I didn't want to have to do that, she was happier in a rope halter but it is not practical for schooling for Dressage and I found that it would slip down her nose every few minutes, the Light Rider bridle stays put and only applies pressure when I ask it to, I can also ride with a consistent light contact! ​I was warned that riding with a bitless bridle wasn't safe because it offers less control, well I can tell you that if anything it offers more control because my mare is 'with me' all the time and listening, not worrying about the bit, she is MUCH more responsive and much lighter. I feel completely safe and 'in control' having the Light Rider on my mare and I plan to start two youngsters later this year using this bridle. I am very, very happy with my new bridle, I have tried a few different types of bitless bridles and this is by far the best I have come across, thank you for designing it and making it available! Now, any possibility we could have the same thing in a lovely good quality leather to use in competitions (when we finally manage to get them approved)? :). " Siobhan D. Western Australia. "The light rider bitless bridle has given me the opportunity to have a real conversation while riding my horse, due to the absence of pain, which otherwise is caused by a bit. When a bitted bridle is put on my horse he becomes stressed and tense. Even before I place the bit in his mouth his whole body tenses and his head goes up. Now using the LightRider bitless bridle he lowers his head and waits for me to slip it on. He is also not afraid of being accidentally jabbed in the mouth and with his new barefoot treeless saddle the combination is beautiful. He is more willing to tune into me and concentrate on what I am asking. The LightRider bitless bridle also looks like a normal bridle which I love. Thanks Cynthia for a wonderful product." Vanessa and Echo, Tasmania. “Just to let you know how I am getting on with your rope light rider bitless bridle. It is great and I am very pleased with it. I was already riding my icelandic horse in a bitless cross under type bridle, which was fine for riding out on tracks and she seemed to like it, however when it came to tight turns or trying to get rein and feet coordination, she was bracing against the pull on the rein. I was not able to get a feel - it was a case of hold until she gave then release. The same when turning back to shut a gate (we have lots ) - a complete brace. However with yours it is a lot clearer for her so I just lift the rein and she moves over. Also I thought it is very good for riding out with one rein - just clip lead rope on and leave two reins on if you want. Wonderful. Thanks.” Rikki from U. K.
Thankyou for designing this product. I can't believe the control and how much better I feel riding her now that she is happy. Personally I have ridden horses that accept the bit happily but still didn't feel as in control as I do riding with the bitless bridle. Thankyou again," Jenny K. Tasmania. "I am very happy with the bridle, the lower placing of the noseband worked well, just that bit more sensitivity and lightness, its wonderful to know I can have him in a traditional looking bridle and be bitless too. Plus, when I am finished riding, I can just pop him straight into the float still in his bridle, with the lead rope attached to the centre ring, so no more changing over to the halter in strange environments where things can go wrong" Marina A. Victoria. .
“My horse works great in the Light Rider and with hardly any transition at all, after 10 minutes in the paddock to test the basic controls I was confident enough to head straight out to the trail. And the light brown colour looks absolutely gorgeous on my chestnut Arab. 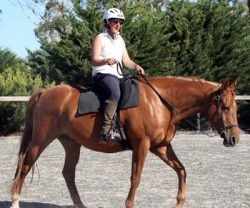 I even went for my first canter in the light rider and at a walk and trot I can still achieve full collection, it's amazing.” Simone L., ACT, Australia. 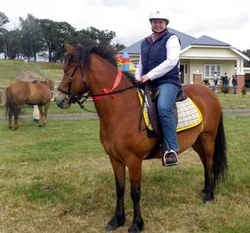 "My partner who had always done his riding/mustering with a bridle and bit was quite sceptical and even concerned to ride our (well behaved) thoroughbred without a bit. He noticed no difference at all between the Light Rider and the bridle-with-bit, from his own point of view, in terms of control during a 2 1/2 hour ride: the horse was settled and responsive to him. I give it full marks, and we both feel confident with it." Toni A. Tasmania. “Am finding it an absolutely AWESOME bridle and can’t thank you enough for the fun we are having.” Karen M. South Africa. “Just to let you know, I received my bridle last week and love it! I put it on my TB gelding, who has literally had a couple of rides over the past week after 12-18 months of no work. I had a lesson Saturday morning and he went brilliantly in it. I've previously been riding him in another bitless bridle (as he's not great with bits) but found the noseband would never stay put and he was still rather resistant at times. In your bridle he was incredibly soft. "Kate was in one of her 'do everything at 100 miles an hour moods'- pulling, rushing and wanting to get home and as you can see she is a big strong girl. Well the bridle didn't miss a beat, I had total control and felt 100% safe. Thank you so much for letting me try it out, I am really impressed with it." Julie S. (Kate and Julie pictured right). Victoria. "Thankyou so much for the bitless, it works a treat. My little mare is loving it. She hated the bit in her mouth and was always a devil to get the bridle on. She has stopped throwing her head and pulling down on me. It's fantastic. What a great product! Even though I have only used it a few times, she is so much better and I feel a lot safer knowing that I have her full concentration. She and I are very happy. Thankyou. Feel free to put this email on your feedback listings for the product. WOW!" Krystlelee T. NSW. "To put Joe’s old bridle with bit on I had to get him in a headlock and stick my thumb in his mouth to prise open his clenched teeth. Getting it off was a similarly tense and unpleasant moment for both of us as he prepared himself to be banged in the teeth (which of course I was careful never to do but which he expected nonetheless). Now, in his new English style light rider bridle, he willingly puts his head down to accept the noseband and to have to removed. He is responsive to just the slightest touch with it and willingly turns to either side. The bridle fits beautifully and looks great, thanks from both of us." "Well we have given Polly's bridle a good work out now. She was a horse that did not like to have a bridle on at all, she would lift her head in the air, clench her teeth and look very miserable when putting the bridle on. Additionally when we first purchased her she had a head shake that was continous 24/7. By riding her in the bitless bridle, head shake nearly gone, does not lift her head up when putting the bitless bridle on, she also remains relaxed and is gaining confidence slowly but steadly. The bridle feels like a quality product, easy to keep clean and looks good on the horse. Overall we are very pleased with our purchase." Sally S. Queensland. "I have ridden bitless for a couple of years now with a crossover bridle and then progressed to a simple rope hackamore. So my mare is quite used to being without a bit, especially for hacking. The crossover does not have the release my mare needs being sensitive, and so the responses to my cues are often delayed and therefore my cues have to shout louder over the noise levels to get her attention. And all I can say is thank you for designing such a wonderful piece of equipment. It is so simple, yet so effective. " Jo UK. Whole New World Opened Up!
" I really love the bitless noseband. It fitted easily and well on my existing bridle and with the clips I ordered as well I could attach my soft leather reins. My instructor, who teaches classical riding (NO pulling the head of the horse behind the vertical etc ...!! ) also thinks it is great. A long standing bad and hard to beat habit of mine was to act with the inside rein slightly downwards and backwards - so I tried bitless riding (inspired after a clinic with Carlos Tabernanerri ) to get away from riding too much with reins and more with the seat and legs. Why should my poor horse Bondi suffer pain in the mouth, when I can't even give the rein aids correctly. Now with your bitless bridle, I am learning to act forward, upward, sideways with the inside rein to get the bend and really use my outside aids to initiate the turn (my instructor had been trying to get me to do this with the bit, but somehow I just did not get it), I can turn now effortlessly and all the fighting is gone. Bondi happily turns saying " O.K. that’s what you want - no problem " I am learning to turn the whole horse and not just pull on the inside rein. Riding bitless seems much more clear to me and to the horse and has helped me enormously to really understand the right aids. Also rein back works much better and my horse follows my request with much more softness. My horse also does not cough any more when we first go into trot and most amazingly he does not have to poo at the beginning of the ride, which he did every single time, when ridden with the bit. It seems like the bit got his digestive progress going, just that there was nothing to digest! What I really like about bitless riding is that poll flexion cannot be forced (maybe unless one really pulled on the reins hard !? ) and that the horse’s head positions naturally from the poll as here with Bondi going long, low and relaxed while I am concentrating on my seat. It is like a whole new world has opened up to me! Thanks so much again for the nose band.” Eva T. Vic. Amazed at the control of ex-pacer. 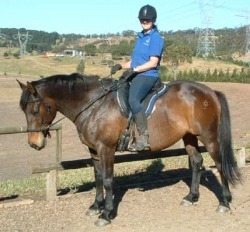 “I have just acquired a Standardbred who was used for pacing. His mouth is quite badly scarred and he was always fighting against the bit. I would have never used a bitless bridle before, but am amazed at what control I have. I now have both brakes and reverse and it can all be done with such gentle hand movements. I am really impressed, it’s an amazing design. Thanks.” Kate G. WA. Less bracey due to the release. Both of them just felt so relaxed, I can't tell you how nice it was to ride without hearing my mare chew and chew her bit. When I initially got on, both of them tried to evade it as though it was a halter. After a couple of tries they took to it like they'd been ridden in it for life. I then headed out into the forestry for an hour on each. My mare was so light and responsive in it and has totally accepted it. My gelding was ultra fresh and just wanted to run. He knew he had freedom from the horrid bit from the word go and really enjoyed himself. I love being able to unclip the reins and let them go :-) I just love it!! !” Nicole C. QLD. Simple to put on and use.